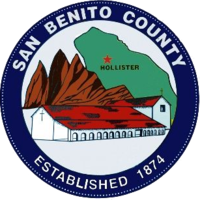 San Benito County is a county in the U.S. state of California. As of the 2010 census, 55,269 people lived there. The county seat is Hollister. It was founded in 1874. This page was last changed on 16 September 2018, at 21:14.